(Bloomberg) -- President Donald Trump said Tuesday it "would be bad" if Saudi Arabia's crown prince and king knew about what happened to dissident journalist Jamal Khashoggi, who disappeared two weeks ago after entering the Saudi consulate in Istanbul. "It depends whether or not the king or the crown prince knew about it in my opinion," Trump said, according to excerpts of an interview with Fox Business Network's "Trish Regan Primetime," scheduled to air Tuesday evening. "If they knew about it, that would be bad." But in an interview with the Associated Press on Tuesday, Trump expressed skepticism over the growing criticism of the Saudi rulers in the Khashoggi case, and compared it to allegations against Supreme Court Justice Brett Kavanaugh. "I think we have to find out what happened first," the president told the AP. "Here we go again with, you know, you're guilty until proven innocent. I don't like that. We just went through that with Justice Kavanaugh and he was innocent all the way as far as I'm concerned." Secretary of State Michael Pompeo said after a day of meetings in Saudi Arabia that the kingdom's leadership has demonstrated a "serious commitment to determine all the facts and ensure accountability" -- including of senior leaders and officials, if necessary. Trump said earlier on Twitter that he had spoken with Crown Prince Mohammed bin Salman, who denied to him and Pompeo any knowledge of Khashoggi's fate and said the Saudi government would expand an investigation into what happened. "Just spoke with the Crown Prince of Saudi Arabia who totally denied any knowledge of what took place in their Turkish Consulate," Trump said, adding in a separate tweet that Prince Mohammed said "he has already started, and will rapidly expand, a full and complete investigation into this matter. Answers will be forthcoming shortly." Trump publicized the crown prince's denial as he faces rising pressure to act against a regime that has been a linchpin of his administration's Middle East strategy. Saudi Arabia will benefit from the administration's plans to tighten sanctions on Iran with new curbs on Tehran's oil exports and the administration is counting on Riyadh to increase oil production to avoid a surge in prices. Republican Senator Lindsey Graham of South Carolina slammed Prince Mohammed earlier in the day as a "wrecking ball" and "toxic" figure who he said was directly responsible for Khashoggi's disappearance and possible killing. Graham -- an influential foreign policy hawk in Congress who frequently advises Trump -- said on "Fox and Friends" he'd support efforts to "sanction the hell out of Saudi Arabia." Attorney General Jeff Sessions said the Justice Department is assessing what action it can take in the matter. Khashoggi was a U.S. resident. 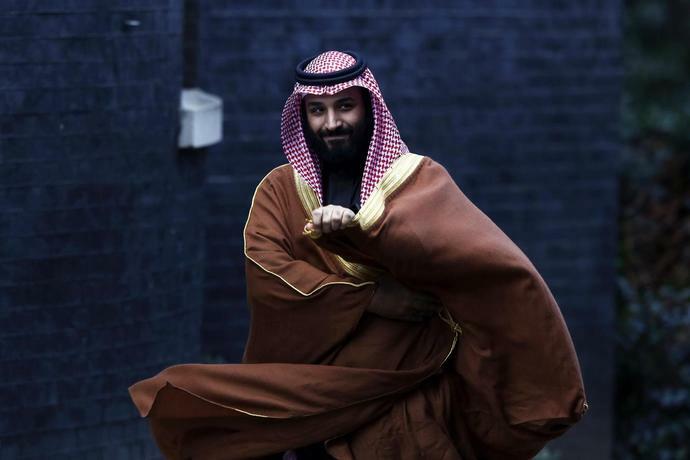 The crown prince's stance is consistent with a narrative Saudi Arabia is considering, according to media reports, to deflect suspicions that the royal court ordered Khashoggi killed and give the U.S. room to avoid confronting an important Middle Eastern power. The possible story line would be to portray the death as a result of a botched interrogation, according to reports by CNN, the New York Times and the Wall Street Journal. That would dovetail with comments Trump made Monday that "rogue killers" could have been behind the alleged killing of Khashoggi, who was last seen entering the Saudi consulate in Istanbul on Oct. 2. Turkish officials have said they believe the journalist was killed inside. As he wrapped up his meetings in Saudi Arabia, Pompeo said that Saudi leaders had "denied any knowledge of what took place in their consulate in Istanbul." In a Bloomberg interview on Oct. 3, Prince Mohammed said it was his understanding that Khashoggi had left the consulate shortly after entering but he wasn't sure. Pompeo now flies to Turkey to meet senior officials there on Wednesday before returning to Washington. Turkish officials stepped up pressure on the Saudis over the episode, providing the Washington Post with scans of passports that they say were carried by seven men who were part of a Saudi team involved in killing Khashoggi. Khashoggi was a Washington Post contributor. Graham said attempts to deflect blame from the crown prince won't work. --With assistance from Nick Wadhams.